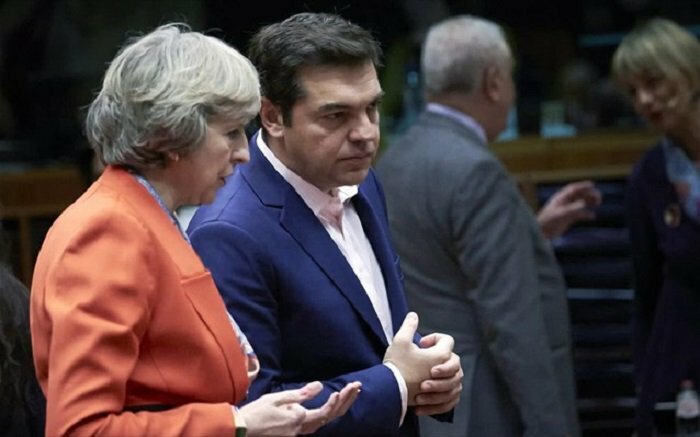 UK Prime Minister Theresa May spoke with Greek Prime Minister Alexis Tsipras Wednesday morning to discuss the ongoing talks in Switzerland towards a Cyprus settlement. The phone call came as reports are swirling around that the prime ministers of the three guarantor powers, Greece, Turkey and Britain would be going to Switzerland, indicating that big moves would be afoot if this was confirmed. A Downing Street spokesman said that “the Prime Minister [May] praised the constructive role that both parties have played to reach this point and reiterated that there is a major opportunity to be seized,” he said. According to Tsipras’ office the two leaders agreed to support a sustainable and fair solution for Cyprus based on the UN resolutions. All sides in Crans-Montana appeared to be waiting on Wednesday for news of the arrival of UN Secretary-General Antonio Guterres as the morning conference session was postponed at the request of the two leaders, President Nikos Anastasiades and Turkish Cypriot leader Mustafa Akinci, and the main session was pushed back until evening. On Wednesday, however, it was not even certain that Guterres would go to Crans-Montana.